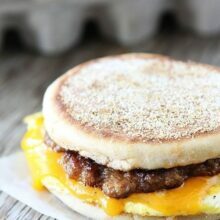 Sausage, Egg, and Cheese Breakfast Sandwich with Maple Butter-start your day with a hearty breakfast sandwich! Earlier this week I shared my Subaru Ski Challenge at Snowbird Video and today I am sharing my favorite pre-ski breakfast. 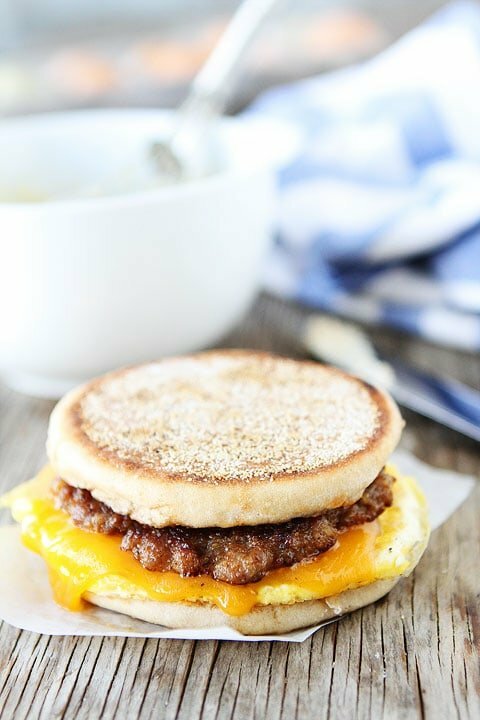 This Sausage, Egg, and Cheese Breakfast Sandwich Maple Butter is the perfect way to start any day, but especially a day on the slopes! It is hearty, filling, and easy to make, which is a big bonus. 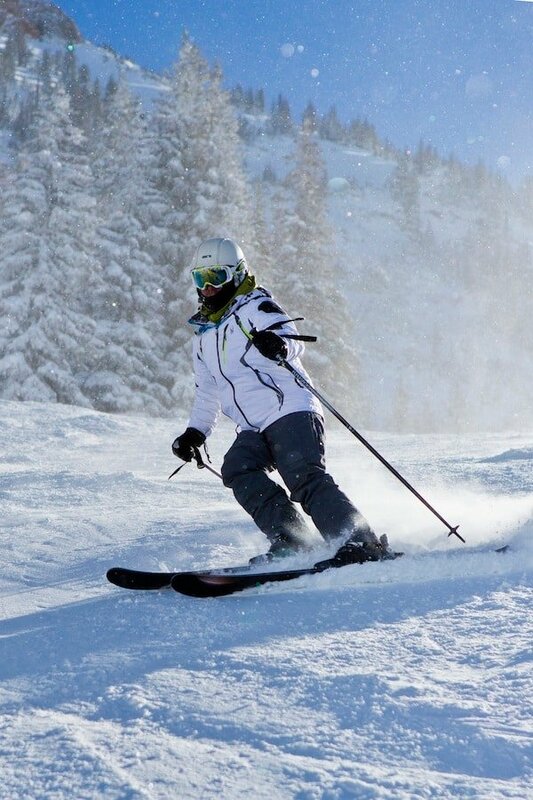 I like to be up on the mountain right when the resort opens so I can ski the fresh powder. I need a quick breakfast that will give me the energy I need to ski all day. 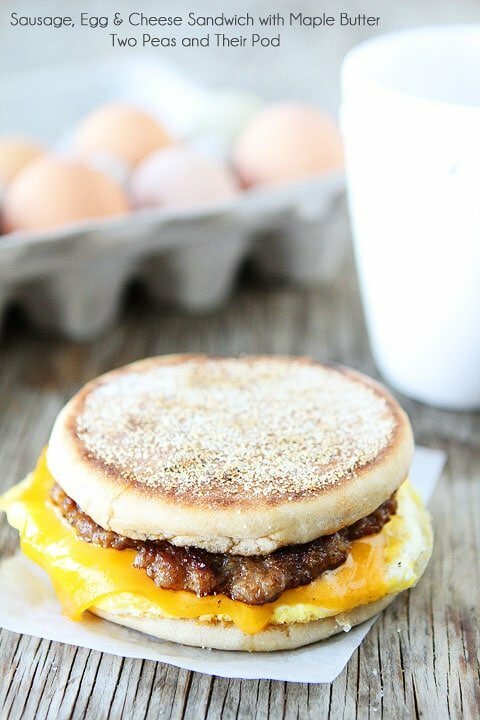 This Sausage, Egg, and Cheese Breakfast Sandwich with Maple Butter is my go to breakfast. Sometimes I am tempted to just stop and buy a sandwich on my way up to the resort, but Maria doesn’t like me to eat fast food. Plus, my sandwich is way better. The secret to my sandwich is the maple butter. I mix softened butter and pure maple syrup together and spread it on a toasted English muffin. Maple and sausage are a great combo! I also add an egg and slice of Cheddar cheese. I put my sandwich together and eat it on my way out the door! I love a breakfast I can eat on the go! And if I have a little extra time, I will make up a few extra sandwiches. I wrap them up and put them in the fridge for later in the week. You can’t beat a good breakfast sandwich before a good day of fresh powder! 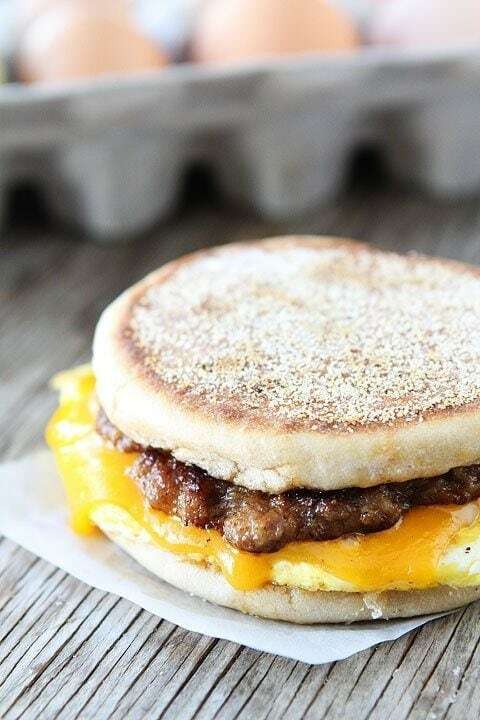 Start your day with a Sausage, Egg, and Cheese Breakfast Sandwich with Maple Butter and then hit the slopes! Josh's favorite breakfast sandwich! The maple butter makes it extra special! 1. Form sausage into 4 patties. Cook in a large, non-stick sprayed skillet over medium-high heat for 3-4 minutes a side, or until golden brown and crisp. Place sausage patties on a paper towel-lined plate to drain the grease. 2. Drain fat from skillet then return to stove and turn heat down to medium. Whisk eggs, salt, and pepper in a bowl then pour into the skillet. Cook until top is nearly set but still glossy, then carefully fold eggs over in half. Remove from heat to finish cooking. 3. In a small bowl, whisk butter until creamy and smooth. Stir in the maple syrup. Toast the English Muffins. 4. To assemble: Spread 1 tablespoon of maple butter on English Muffin, both halves. Place 1 egg on the bottom of a English muffin then top with cooked sausage patty and slice of cheese. Microwave for 20-30 seconds to melt cheese then cap with English muffin top. Continue making other sandwiches. Serve immediately. Great cold weather fuel for sure! Plus its got that sweet and salty thing going on, which is always amazing!! This is way better than fast food. And the maple butter puts it over the top. I love a nice breakfast like this and the maple butter is a genius idea! I love it!!! This looks like the perfect way to start the day….much better then those sandwiches from fast food places! I am lovin’ the idea of some maple butter. YUM! Totally, totally totallytaotyaotyaotyaoty my kind of brekky. 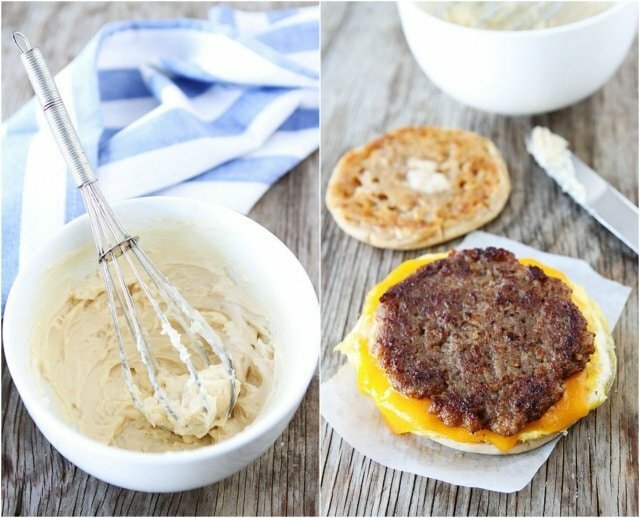 My husband loves maple breakfast sausage so I’m sure he would love the maple butter on these! 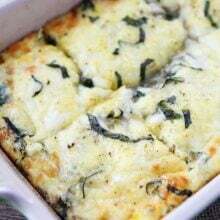 This is such a wonderful breakfast recipe. Love maple butter! Looks like the perfect breakfast! And the maple butter addition sounds delish!! I could go for one of those right now!! Omg. I need this, like, five minutes ago! This sounds soooo yummy!! The maple butter really makes this extraordinary! … And suddenly I need this. Funny thing about pregnancy, just looking at a food can make you crave it insanely, ha! This sandwich is so mouthwatering! The ski trip looked amazing, and the maple butter. Well, I’ll just rub that on everything, thanks. My favorite thing to order at a diner is a sausage, egg, and cheese sandwich and a single pancake (instead of potatoes). Then, mopping up the extra syrup with the sandwich. This is the perfect all in one. Love the sound of the maple butter on this breakfast sandwich. I’m so jealous of the powdery white snow! Yes, please! I love breakfast sandwiches, and this sounds so good with the maple butter. oh what I would give for one of these right now!! This looks delicious! I make something similar to this, but without the maple butter…not anymore though!! This sounds awesome! 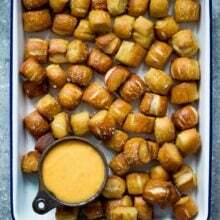 Nice twist to add sweet maple butter. I will try this one. I got a Sandwich maker for Christmas so easy and quick now. I love the idea of adding a dollop of sweetness to this savory egg sandwich! A must try. Quick question: do you cook all eggs at once and slice into fourths or cook each one individually? Thanks! I’m kind of a novice cook, so this might be a silly question – since you say to whisk eggs in a bowl, then pour into skillet – do you mean do all 4 eggs at once kind of like an omelet, then cut in 4 pieces ? Don’t really understand the egg part. Thanks! You can cook the eggs separate if you wish or you can cook them all at once and cut them to fit the sandwiches. I hope that makes sense! This looks delicious and easy. I have a question, is this freezable after cooking? It’s just two of us at the moment and I want to be able to make a batch on the weekend and then freeze and heat up in the morning through out the week. This looks so yummy! perfect breakfast! 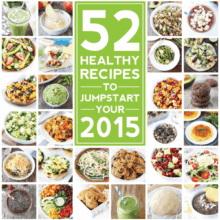 Pingback: 22 Healthy Breakfast Recipes For Kids. Simple and Delicious! Instead of microwaving immediately wrapping these take out style in either wax paper or foil, results in a better melt, and also softens the English muffin while not making them soggy.